Why let a skilled technician handle all your electrical installation work? 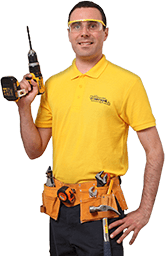 Contact Fantastic Handyman in London as soon as possible and we will send over a qualified electrician to help and do the job for you while staying true to all legal requirements for electrical installations. Why grab a pair of wire cutters and hope for the best when licensed help is just around the corner? Each London specialist is fully qualified and has years of experience in their respective field, and it shows – diligent and polite, they have earned the trust of thousands of satisfied customers. Set up your tray work electrical installation session with ease. Hiring the precise electrician will only take a few minutes of your time. All you need to do is reach out to our helpful advisers on our online chat, via our customer-friendly booking form, or by downloading our GoFantastic app. You can also make all your electrical install arrangements by dialling 020 3404 4045. The lightning-fast team will then arrive at your preferred time to fix everything for you. You decide when you want to get things done. Just because our service conforms to all British standards for electrical installations doesn't mean that you should wait in line. Quite the opposite – your qualified electrician can visit you at any day of the week, weekends and bank holidays included. And if you are really in a hurry, we will also gladly offer you a same-day service. As you can see, with Fantastic Handyman, things will always go your way! Enjoy a wide service coverage. The skilled professionals can easily travel to and install quality electric installations in any given London district. So, no matter where your home is located in the capital, the team will always be able to visit your address on time to fix or install your electrical installation with little to no hassle.